Hello, thanks for visiting! 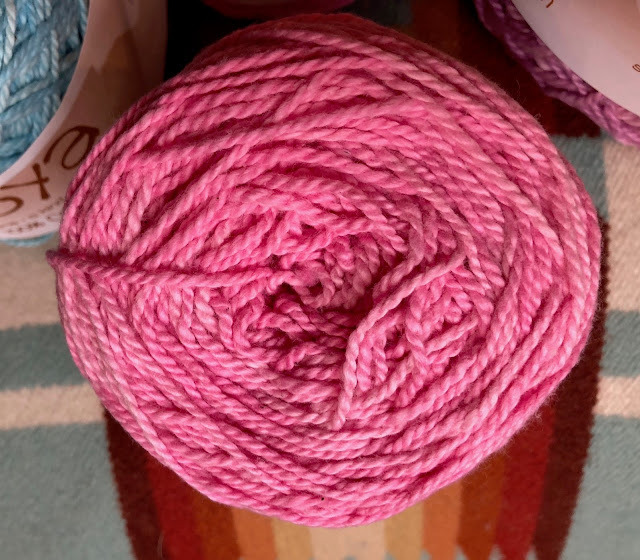 I've been wearing and enjoying my Sunday Shawl since the flowers have been blooming and Spring seems to be here - but it's still chilly enough to need a hat - and so I decided to get some of the same yarn I used on the shawl to make a colorful matching hat! It arrived yesterday. 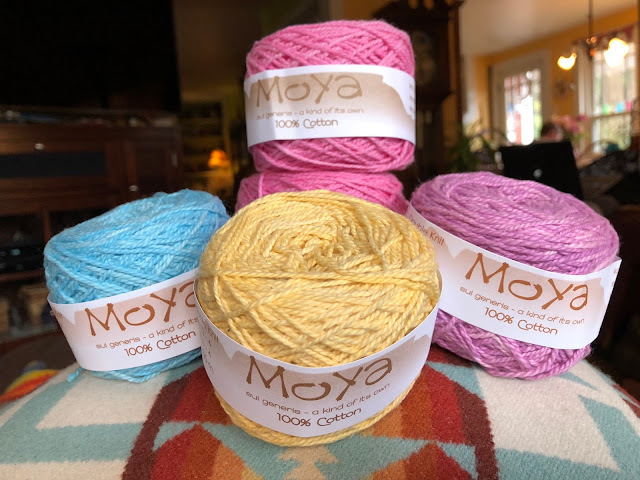 I really adore this yarn - it's made and dyed by a mother daughter team in Africa. I love supporting their small business there. I buy it from Julie at Little Woolie Makes online shop in Victoria, Australia. Now to decide on a pattern that will have as much excitement as the Sunday Shawl! I love how organic this yarn looks. The dye is a bit erratic, which I actually like. I have gotten several compliments when I wear this. I have decided that at the age of almost 69 years of age, I'm done wearing dark muted colors and am embracing color. 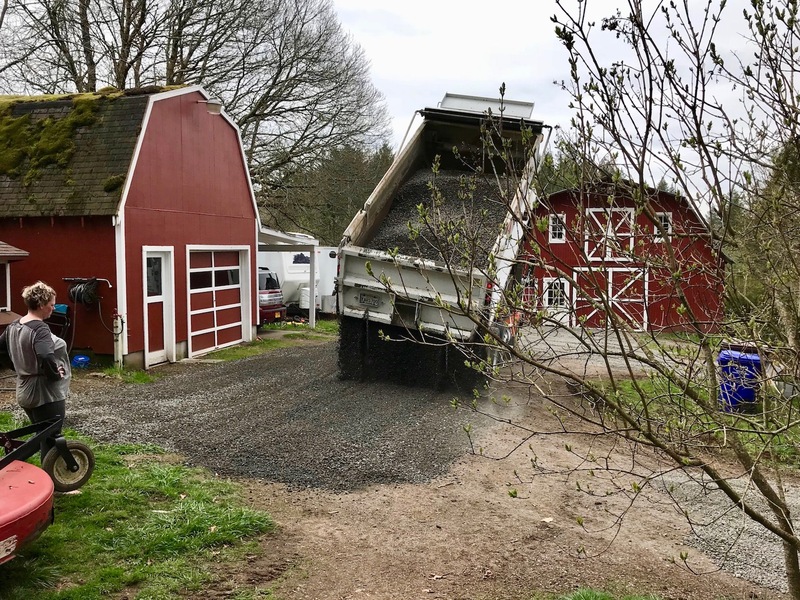 We've been needing a new layer of gravel on our circular driveway, it's gotten quite muddy in the last few years. So Dayle ordered 4 truckloads of gravel and it was delivered and spread last Friday. It looks so much better now! 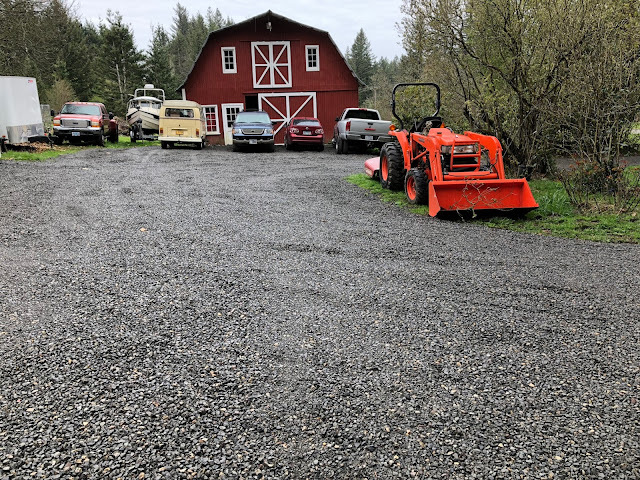 Kristi watched and Dayle showed them where he wanted it and Shawn, our eldest son, used our tractor to smooth it out. No more mud! I'm just pleased having it all look so nice and tidy. 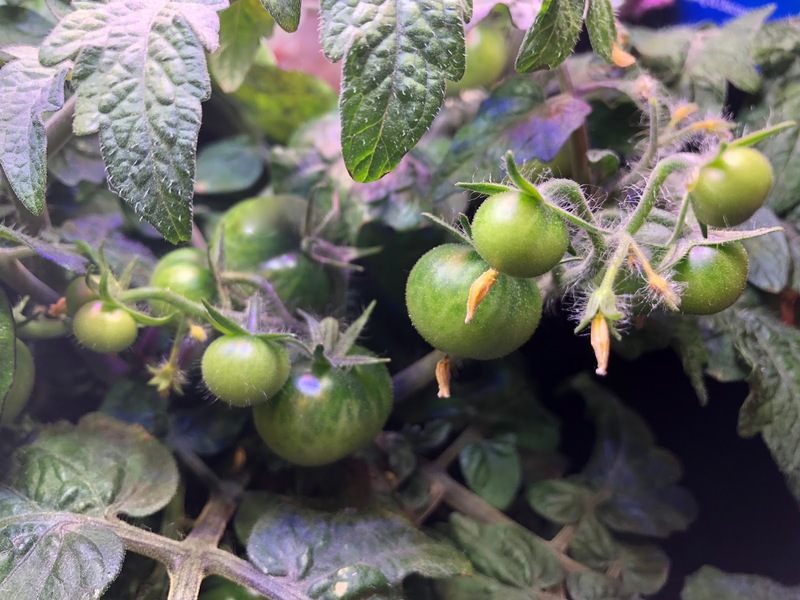 I'm still fascinated with the little tomatoes growing on our kitchen counter in the boy's little grow garden. 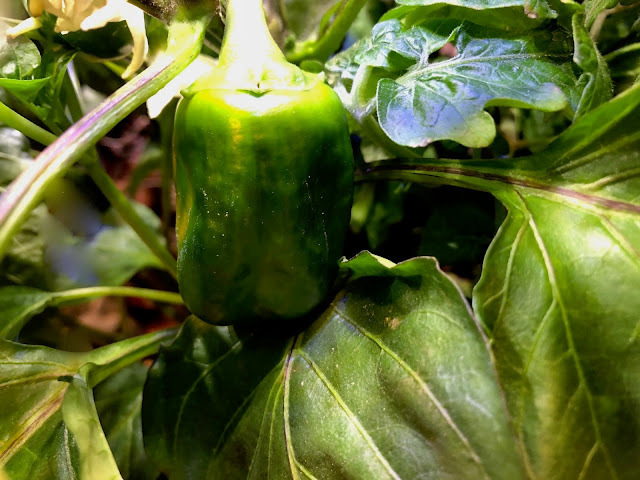 I can't wait to see one turn red! The green pepper is getting big, too! Well.. time for me to get ready to attend a funeral of a friend, Nev Scott. She was quite a character and I expect a huge crowd at the church for her service. She was 86. She and I worked together on the Vista House project. 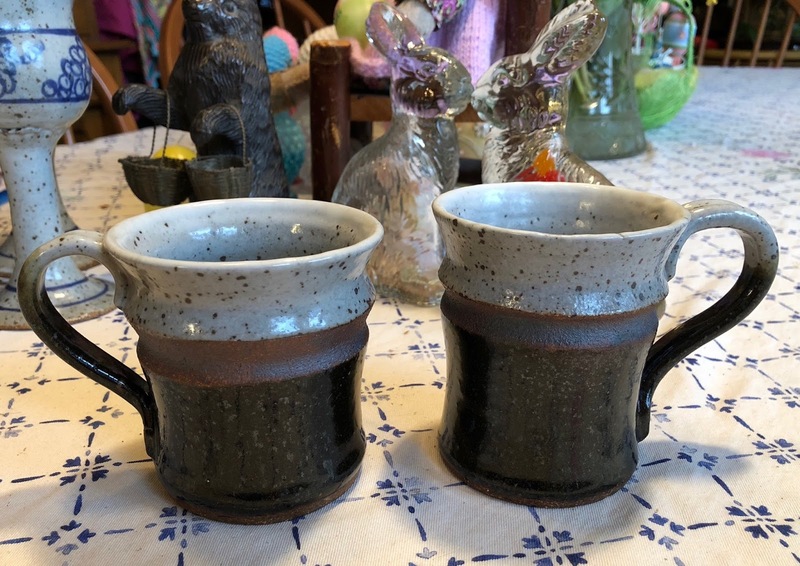 I love seeing you goblets and mugs. Nothing quite like handmade items. I also love that you are embracing color. At 50, I am enjoying it already! Wow the cotton from Australia and in Victoria that is my state too. Yes we lost a dear friend while in nz but lucky here to say goodbye before he died. your goblets are nice and so are the cups. Good job! nice yarn and love your scarf. I was looking at a few bday cards I have on top of my desk. One is from my girlfriend, Laura, who died in Sept. I loved that card from 2014...memory card ME design! I enjoyed our friendship immensely! Glad I knew her! I was given a 2nd chance when Gerard recovered fro a heart attack, he knows I love him but now I tell him everyday. I am so thankful for the extra time we have been given. 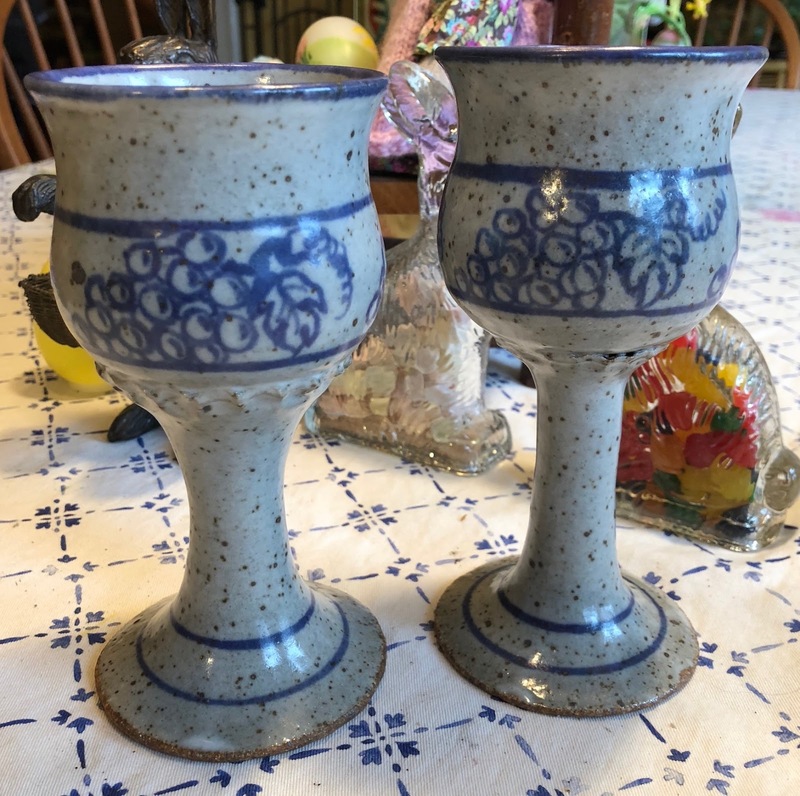 Love the goblets, their imperfection adds to the charm. Wow, lots going on. The drive looks great, the colours of that cotton is beautiful, and the hand made mugs, you are so talented Teresa. I really like that yarn and I agree, it’s time for us to wear color! I also agree with your advice to tell people how we feel about them right now because, well, you just never know what tomorrow will bring. 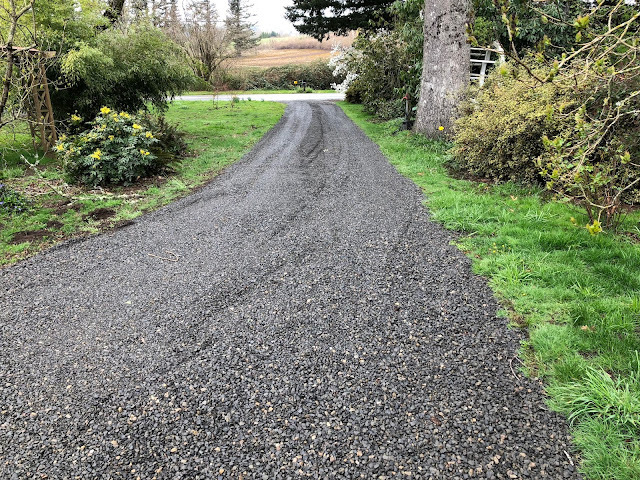 The new gravel looks great in the driveway. It’s a good thing you have so much property to park all those cars! Ha ha! And finally, I love your pottery. You are such a talented lady in so many ways. You really should open your own art gallery. I had a look at the yarn shop ..it looks good...you are so lucky that you can buy from other countries...we are only allowed goods up to about $20 without customs charges(and they are huge)so we are really limited with what we can buy. Sometimes the shipping is twice the price of the goods. I am hoping after Brexit we can do better deals with the US and Australia. Lovely post from you as always. Those are really pretty goblets Teresa! Can't wait to see your hat creation - it will look great with your beautiful shawl. 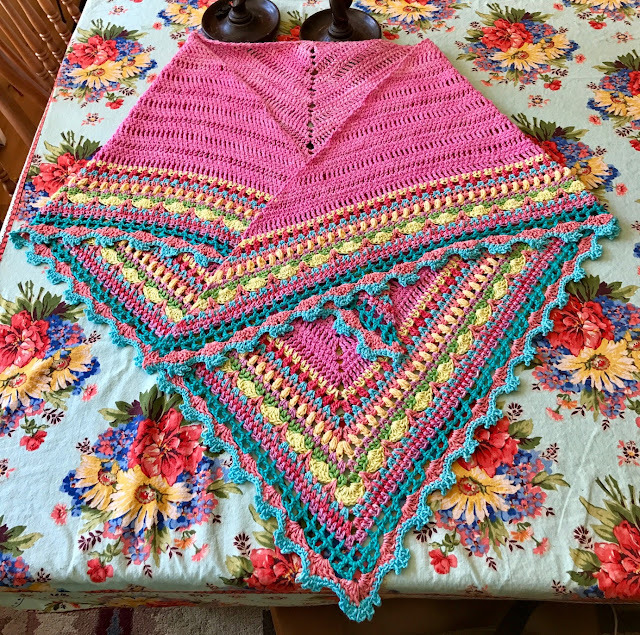 Love, love, love that shawl! Beautiful! !